The Lingfield Derby Trial may have struggled to live up to its billing in recent years but it still has a fine history of producing classic winners. Teenoso, Slip Anchor and Kahyasi all won this race in the 1980’s before going on to triumph at Epsom. High-Rise was the last horse to complete the double in 1998 but it is still producing high-class winners. Any one of four horses could go off favourite here in a competitive renewal. Aidan O’Brien has trained three of the last six winners and has already picked up two Derby trials at Chester this week. With Australia hot favourite for Epsom after his fine run in the 2000 Guineas, O’Brien is likely to have a very strong hand in the mile and a half classic again this year. His representatives here are Mekong River and Blue Hussar. The former won his first four starts including the Listed Eyrefield Stakes at Leopardstown in November. He was far from disgraced when fourth in the Group 1 Criterium de Saint-Cloud on his final start, a race run on heavy ground. The son of Galileo is entered in all the big middle-distance events and may be the pick of the Ballydoyle duo and could be a good bet at 4-1 with Bet365. Blue Hussar is a son of Montjeu who won on his debut at Leopardstown in November. He will be partnered by Ryan Moore who has a fine strike-rate on the O’Brien horses. Sir Michael Stoute may be struggling for a Derby candidate this year and he relies on Snow Sky, a fair second to Western Hymn at Newbury last month. 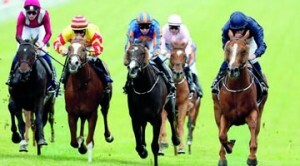 Were he to win here, it would be a major form boost for his recent conqueror who has since followed up in fine style. Godolphin’s big hope here is Sudden Wonder who just got the better of Observational at Newmarket at the Craven meeting. The third home was well beaten at Chester this week so the form does not look particularly outstanding. John Gosden trains Western Hymn who would currently be his number one Derby hope but he has a live contender here in Munjaz. He is a strapping son of Sea The Stars and looked unlucky not to win his maiden at Newmarket last autumn. He put matters right with a victory on his debut this season and should relish the extra distance. Mark Johnston saddles Double Bluff and Hartnell but both look to have plenty to find on official ratings. Signposted and Red Galileo both look to have a good future in handicap company but it would be surprising if they were good enough here. 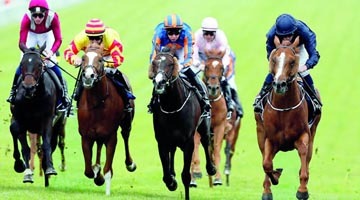 The race is due off at 2.55 over a distance just short of the Epsom Derby trip.